Hello January!! When it’s my week to post, I try really hard not to post the same kind of recipes because there are so many delightful things out there just waiting to be explored, but for me, January screams soup! 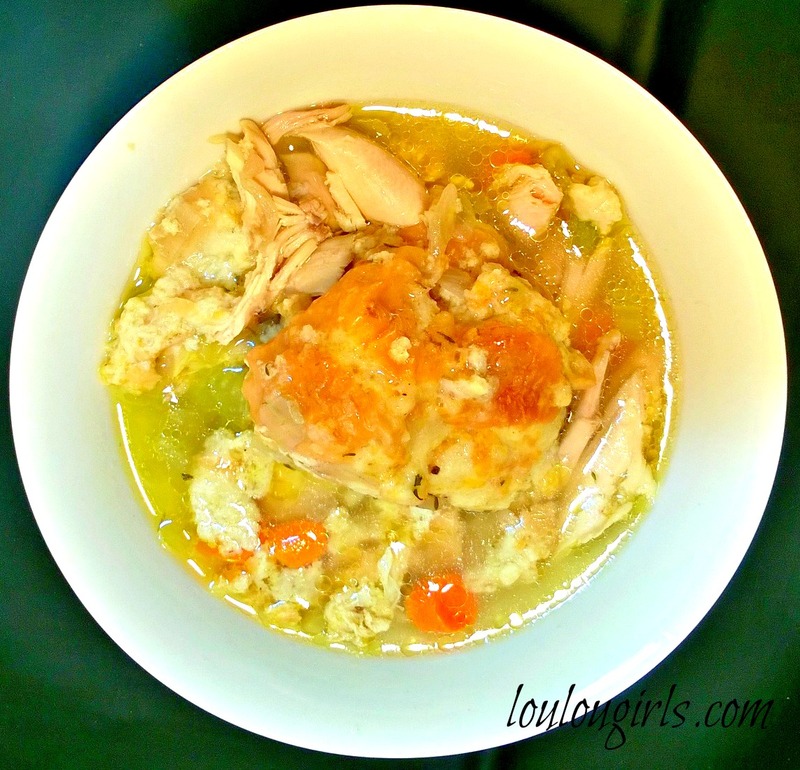 I love chicken and I love dumplings! I have never tried to make a bread dumpling for soup before and I couldn’t wait to try it! This is a hearty soup that will take the chill off winter and make your family do the happy dance! The best thing about this recipe is that it’s really healthy and with so many coughs and sniffles going around, it’s just what the doctor ordered! In a large pot or dutch oven, add the olive oil and turn the heat to medium. Add the carrots, celery, onion, and garlic, plus a large pinch of salt. Cook until tender, it will take about 5 minutes. Add the thyme, bay leaves, and the whole chicken to the pot. Add enough chicken broth to cover the chicken. Bring to a boil, then reduce the heat to a simmer and cook for 1 hour. Remove the chicken and set aside to cool. Once cool enough to touch, pick off the meat and shred into bite sized pieces. Set aside. Dumplings: In a medium pan, combine the milk, nutmeg, and 1/2 teaspoon each of salt and pepper. Bring to a simmer and remover from heat. Take a large bowl, add the stale bread cubes, and the warm milk mixture. Using a spatula, stir until the liquid has absorbed. Let soak for 10 minutes. Add the breadcrumbs and eggs. Mix to combine and to make a thick dough. If too wet add a little more breadcrumbs. Remove the bay leaves from the stock and add the corn and chicken pieces. Bring the soup to a boil. Wet your hands and form the dough into eight dumplings, the size of a golf ball. Gently drop dumplings into the soup. Bring to a simmer, cover and cook until the dumplings float to the surface and are cooked through, about 10 to 15 minutes. Yum! This one looks good too! I was "parked" near you on Think Tank today, and I came over to find your post. I may have to try this recipe too! 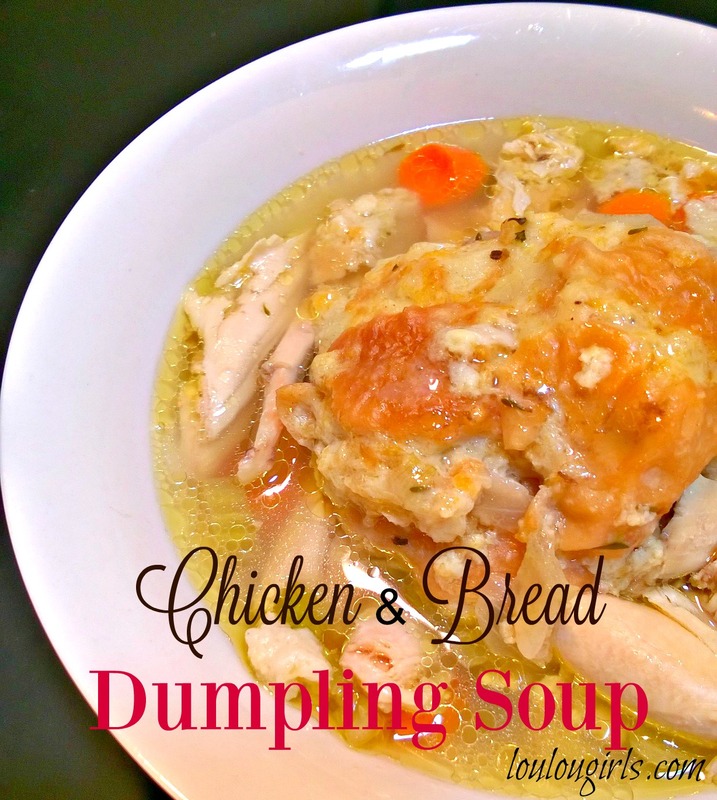 What a great idea to make Dumpling Soup, looks like a delicious bowl of goodness. Thanks so much for sharing with Full Plate Thursday and have a great day! I agree, it's the best time for soup. It's so cold out that I need to warm up from the inside out! And keeping loaded up on the vitamins is good for fighting off a cold or keeping one at bay! Pinned! This looks so good!! I will have to make this for my daughter when she gets home from Marine Bootcamp! Thank you for sharing and linking up with us at the Welcome Home Wednesdays Link Party!! Yum! I think nutmeg is an interesting choice. I can't wait to taste this! Thanks for sharing at Merry Monday!